Ethan is passionate about retirement and financial planning. He enjoys solving complex planning issues and assisting plan sponsors with retirement plan concepts. His interest in financial services started in college through the mentorship of a professor teaching finance. Upon graduating from Biola University with a Bachelor of Science in Business Management, Ethan started his career at AON Hewitt, a Fortune 500 company, calculating pension benefits for companies across the nation in various industries. He then transitioned to the 401(k) space where he designed retirement plans for a Professional Employer Organization (PEO). In his role working with employees, he helped the PEO grow their plan by over $25 million. 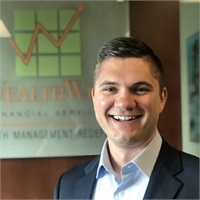 In joining WealthWise Financial Services, he brings a background in corporate retirement plans as well as working with individuals to help them accomplish their financial goals. He, his wife Sandra, and their two dogs enjoy spending their spare time outdoors. If they are not at the beach, you can usually find them on a hiking trail or spending time with friends and family.